For those who are able to take the time and to find the stillness of spirit needed to allow it to happen certain sacred landscapes can imprint themselves on our souls. I’ve visited many amazing and beautiful places but only three have sunk deep into my being in this way. The Camino to Santiago de Compostela in Spain, the island of Iona and now Glendalough in the Wicklow Mountains, Ireland. What these landscapes have in common is the centuries of prayer from pilgrims walking the way or monastic communities with their liturgical rhythms. Just as the footsteps of thousands, millions of pilgrims wear a groove in solid rock so the centuries of devotion dig a deep well until the landscape itself becomes a prayer that holds a gift for us if we are able to receive it. This means more than simply ticking the place off on a list of places to see before you die. The tourist consumes a landscape or a history and then moves onto the next place (not that there’s anything wrong with that per se, I’ve done plenty of consuming in my life, but there are better reasons to climb a mountain than just to get a selfie at the summit to post on Facebook). If we take time, to stay, to wander and to wonder and to push through the undergrowth away from the manicured tourist trail then slowly and gently the gift of place will open up to us. The only way to ask this question of a place is to deeply engage with it, smell it, feel the soft earth, swim in cold dark water, sit on hard rock or experience the pain in your legs as you climb to the precipitous waterfall. 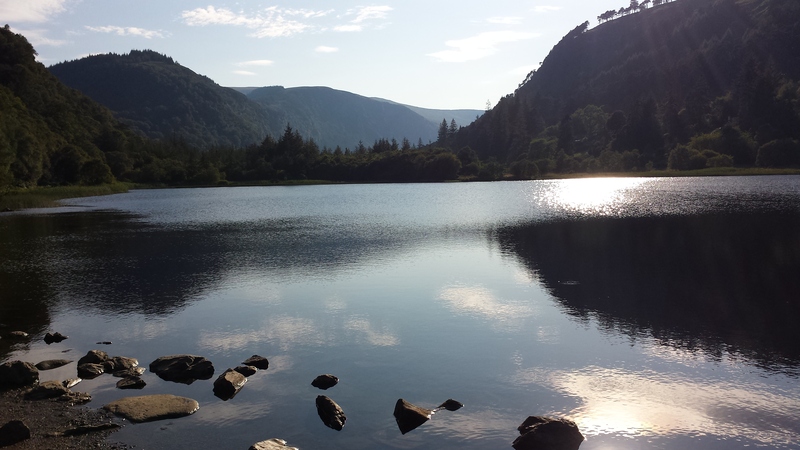 So I’ve had a few days to wander and to wait at Glendalough which translates as “valley of the two lakes”. It is an ancient site of Celtic Christianity and was probably a sacred pagan site before that; a place where the urge for men and women to push deep into the world has been going on since before the birth of Christ. There is a sacred well not far from the Monastic City who’s opening looks like the entrance to the womb of the earth and there is a sense of life flowing into the world throughout the valley. I learnt so much whilst I was there that can’t be put into words because the place has shaped the deeper parts of my being, and such stories can’t survive being brought to the surface, like weird deep sea fish that dwell in darkness beneath miles of ocean. But amongst all of that there is something in the story of the landscape itself that I know will shape my life and ministry. The two lakes in the valley have very different characters. The lower lake is smaller with reed beds and a gently sloping bed so soft with the fallen leaves of ages that when I waded in to swim I sunk to my knee in the soft mulch. It’s near the lower Lake that St Kevin established what became a “Monastic City”: intentionally modelled on the experience of the desert fathers and mothers from a far off land and very different clime. The city was a community of sanctuary, abuzz with creativity, industry and a hospitable welcome for travellers. The upper lake is larger and darker; its rocky bed quickly plunges to depths, cliffs tower on the south shore where Kevin would often retreat to his cell high in the forest or to “Kevin’s Bed”, a cave all but inaccessible without a treacherous climb. Wild waterfalls, glorious and dangerous swirl down the mountainside. This place is known as St Kevin’s Desert, the place he often retreated to for solitude, prayer and ascetic practices including standing in the cold water to pray whilst a monster wrapped itself around him, stinging him or praying in his cell with arms outstretched for days. There is much to learn from these two lakes, connected by a twisting river. The oscillation between solitude and community is written in the landscape. I get the impression that Kevin preferred the former but his experience of Christ as he prayed alone in the forest compelled him to engage with others. I’m with Kevin on that one (although I’ll give his extreme asceticism a miss if that’s alright Kev). Sitting now in a cafe at Dublin airport after a few days of near solitude is almost overwhelming. Artificial colours brash and harsh shout much louder than the earth tones and greens of the valley. But in the stillness and sitting on the solid rock where Kevin’s cell used to stand I found a deeper place to rest and, like the waters flowing from the womb of the earth I know that even in the midst of the city it’s from that place that life will flow. Apart from walking and sitting in solitude another way to engage with a landscape is to paint it. I spent a day painting the seven churches in the valley. 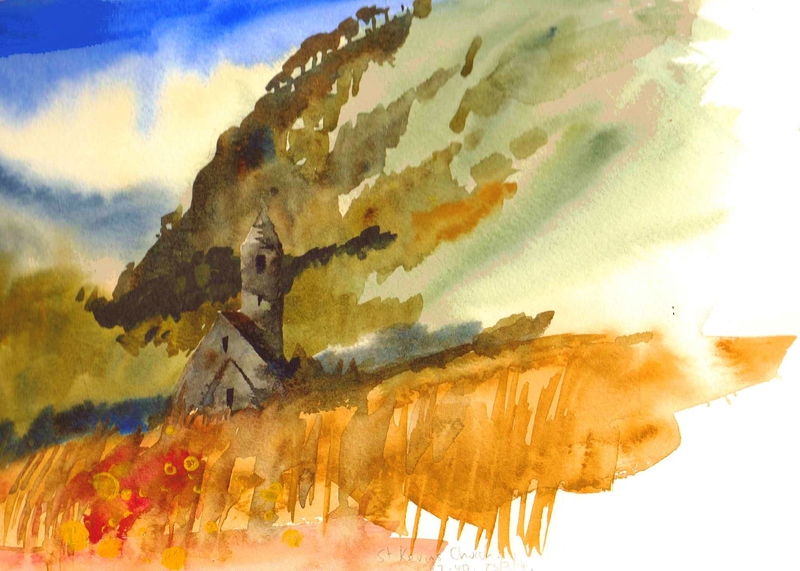 I rarely paint landscapes, and rarely use watercolour so the results are a bit rough and ready – not least because I only had a few minutes to paint each church. But this is my version of St Kevin’s Church.